Nicholas Winton is surprised when he realizes he is in an audience filled with children whose lives he saved. This emotional video clip is from the BBC television program “That’s Life”. Here’s what happened. Milena Grenfell-Baines and 668 other mostly Jewish children were transported from Czechoslovakia to England in order to save their lives before the outbreak of WWII. The man who made this possible was Sir Nicholas Winton. In 1939, Winton and a friend, Martin Blake, were supposed to take a skiing vacation. Instead, Blake, who worked with refugees, told Winton, at the time a 29-year-old stockbroker, that he should visit him in Prague and help with the refugees fleeing Hitler’s advancing armies. Nicholas Winton did go to Prague, and he was deeply affected by what he saw: thousands of refugees driven out of Sudetenland, a Czechoslovakian area recently under Nazi control (Britain and France agreed to allow Hitler to annex a large part of Czechoslovakia in an attempt to avoid a World War and the Nazis had started to take control of the country.) There was no plan to save the refugees from the looming danger of the Nazis. Nicholas Winton contacted multiple governments for help, but only England and Sweden agreed. The British government approved his bringing children to the UK if he could find them homes and make a deposit of 50 pounds for each child. From March to August 1939, Nicholas Winton worked as a stockbroker by day and a rescue worker at night to get the kids to the UK. Winton advertised in British newspapers and in churches and temples to find families. He raised money for transportation and managed logistics—even forging entry permits when the government was moving too slowly. Winton saved 669 children, working until war broke out and kids could no longer leave Czechoslovakia. Winton stresses that he receives too much attention and that his collaborator in Prague—Trevor Chadwick—and everyone who participated deserves credit. In fact, Winton kept his heroic deeds to himself for almost 50 years. His wife, Grete, didn’t even know about his rescue efforts until 1988, when she found his scrapbook in the attic, with records, photos, names and documents from his efforts. With his wife’s encouragement, Winton shared his story, which led to his appearance on the BBC television program That’s Life. The emotional video clip in this article is from that show—you’ll see the moment when he realizes that the studio audience is composed mostly of people he rescued. In 2002, Sir Nicholas Winton was knighted by the Queen of England in recognition of his work. The rescued children, many of them now grandparents, still refer to themselves as “Winton’s children.” And Winton said that hardly a week goes by when he isn’t in touch with one of the children or their relatives. 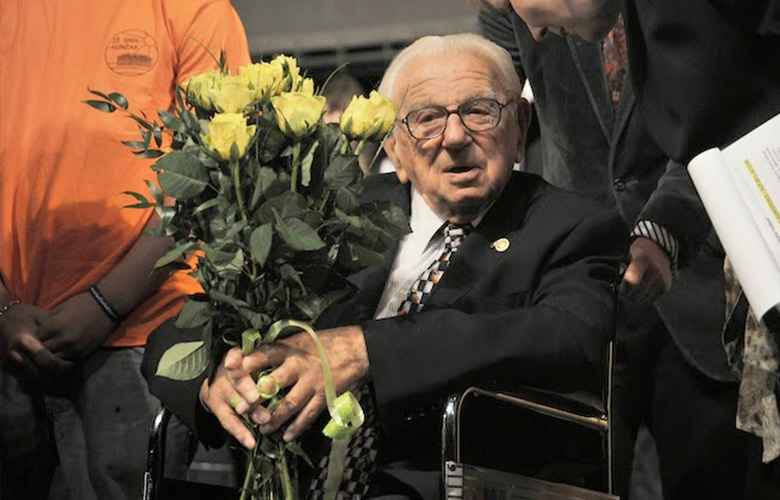 There is currently an online petition you can sign to nominate Sir Nicholas Winton to receive a Nobel Peace Prize. If you enjoyed this article about Nicholas Winton, you should also check out the article about: Jack Andraka a 15-year old who invented a Cancer test 100 times more sensitive and 26,000 times cheaper than current tests.